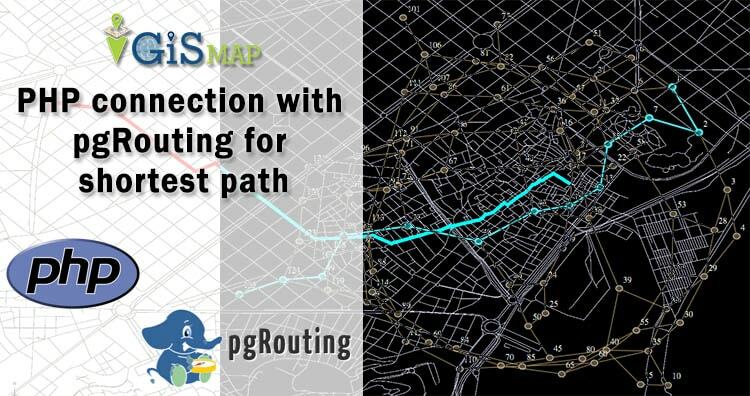 Here in this post we do PHP connection with pgRouting for shortest path. Here we have explained how we can add source and destination point in table and how can we query for shortest route. In this demo we have made a connection between pgrouting and PHP using code igniter using code igniter framework. Here we have uploaded shape file in postgis. For doing this you need to install postgres and create a database. Everything is already explained in earlier tutorial. You can also check Postgres with QGIS. Now the same procedure is implemented using PHP in code igniter framework. As we have an idea about code igniter, which has three main component as view, model and controller. In view section we will be adding PHP code for presenting the shapefile and the output shortest route. In model section will be writing query for getting two end points and shortest path. In controller section we will make function for registration, login and distance. First of all you need to render your shape file on map. The map can be Google map, Open street map or any other map. For rendering the shape file using leaflet you need to add plugin in your script, which can be downloaded from https://github.com/calvinmetcalf/leaflet.shapefile link. Passing shapefile in L.Shapefile() method and calling addTo(map) method we can add the shapefile on map. After that we need to create input boxes for user to enter end points latitude and longitude. Using ajax we have send these latitude and longitude of both start and end point to model and got the result back in view. Then take out the id for given source and destination point and saved them as result in variable start and end. After completing this wrote query using pgr_dijsktra method. This is an algorithm to find out the shortest path. This takes shape file table, start point , end point, boolean result for directed/undirected route and boolean result for having/not having route cost. To get the geometry column from network table applied join. Take this result in calculation variable. After this check for the number of row i.e. the result of query is not empty and take result in distance variable and return is to controller. In the controller, we can call the insert function and pass the required input to called function and also can load the view. Here for this article we have made login session and registration of user. This distance function takes the data in variable in sends to insertLatLong function in Login_Database model. Hope you enjoyed the tutorial. If you face any problem in working with pgRouting please let us know.